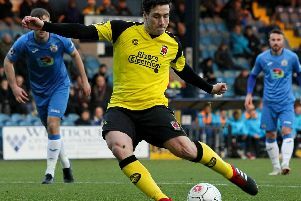 Chorley were well worth their point but it was not enough to retain fifth place in the red-hot race for a play-offs place in the National League North. The Magpies were eased out by Darlington on goal difference as three teams, including Stockport County, now stand on 67 points. This was Chorley’s ninth away draw and if they do miss out it may well be down to a shortfall in the ‘goals for’ column compared to their rivals. Manager Matt Jansen was not downhearted by the loss of two points. “Nuneaton are a decent side who play a lot of good football and it’s a positive to take a point away from home against a team that was good enough to beat Fylde 4-1 recently,” he said. After keeper Ritchie Branagan had made an early diving save from Peterborough loanee Jordan Nicholson, Chorley went ahead in the 11th minute. Jason Walker provided a perfect pass for Dale Whitham to curl a terrific shot into the top corner, giving Tyrell Belford in the Nuneaton goal no chance. This proved to be one of the few stand-out moments of a low-key afternoon. Jansen’s men exerted plenty of first-half pressure but created only half-chances, though Jake Cottrell from close range might have done better than fire over the bar from Matt Challoner’s excellent cross. The Magpies defended their lead with customary efficiency and the home side’s attack carried no sustained threat. But with just over 20 minutes to play, Ashley Chambers breathed new life into the slumbering contest. The on-loan Grimsby striker, with five goals to his credit in his seven games, cleverly controlled a through ball well inside the box and clipped his shot beyond Branagan despite the keeper’s valiant attempt to save. Minutes later it was Branagan’s opposite number Belford who denied Whitham with a pure reflex save. CHORLEY: Branagan, Challoner, Jarvis, Teague, Leather, Jordan, Blakeman (O’Keefe 87), Whitham, Carver, Walker (Sampson 72), Cottrell. Unused subs. Charnock, Beesley, Roscoe.